Administrators now have the option of showing or hiding the Standard Evaluation Input box on evaluation forms. This is helpful if institutions are using custom evaluation forms and do not want the Standard Evaluation Input box to display in the custom form. On the Admin menu, click Administration. In the Administration section, click Evaluations. Select an evaluation to edit, or add a new evaluation. In the Evaluation Forms – Standard Input section, use the Show Standard Input Box option to specify if the Standard Input Evaluation box should display in the selected evaluation form. Administrators can now specify the order that the columns in the Teaching section of the Activity Input Form display. 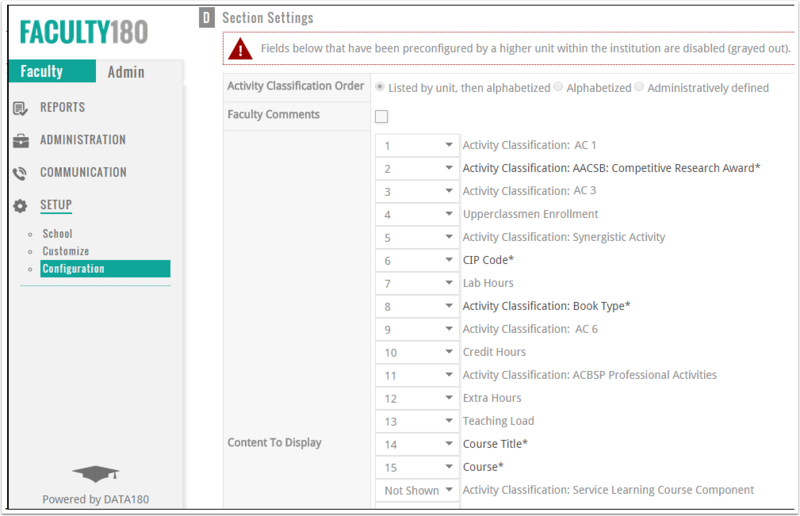 This provides administrators with more flexibility in customizing the display of the Activity Input Form for their institution. On the Admin menu, click Setup. In the Configuration section, click Activity Input Form. Select an activity input form to edit, or add a new activity input form. In the Content section, click the Teaching Edit icon. The Edit Activity Input Section screen displays. In the Section Settings section, specify the order of columns to be shown in the Teaching section. Administrators can now specify if subtotals should display in the Teaching section of the Activity Input Form. This is useful if the subtotal information is not applicable to your institution. In the Section Settings section, select or clear the Display Subtotals check box.